To obtain the data necessary to test this hypothesis, Cook, in collaboration with scientists at TREND tried several approaches, including electroencephalography (EEG), Pupil Studies, EyeTracking and Functional Magnetic Resonance Imaging (fMRI). The hypothesis was confirmed, Cook and the scientists could see noticeable differences in individual images from the fMRI data and in records of electrical brain activity from EEG when volunteers compared flat and woven images. Through the project Cook was not only able to answer her initial questions, but she began to create new work inspired by the experience. 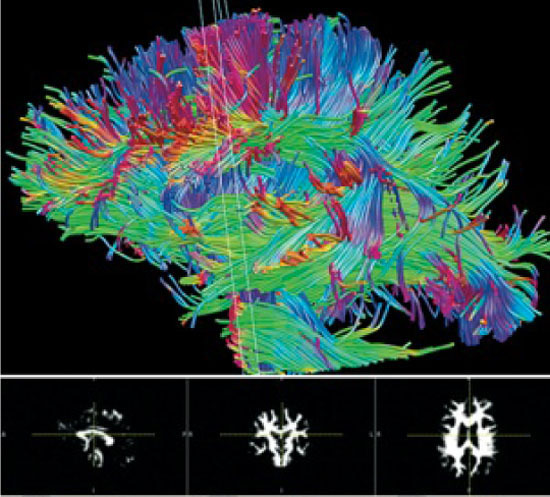 She noticed, for example that the fibers of the brain visible when using Diffusion Spectrum Imaging were similar to the interlacing fibers of textile constructions. 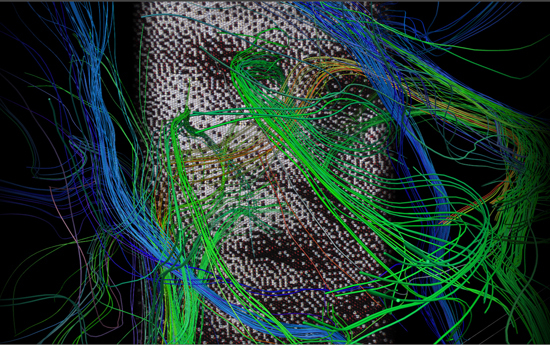 She underwent this imaging on herself and then, using software from MGH/Harvard, Biomedical Imaging Lab, she was able to manipulate the images of these images as a starting point for her latest weavings, which combine faces and images of brain fibers. The result is in keeping with the aim of the TREND residency, which hopes that artists will encourage scientists to think in new creative ways while learning the tools of the scientist to develop their artistic ideas or to look at their art work in new ways. Cook’s description of her experiments. 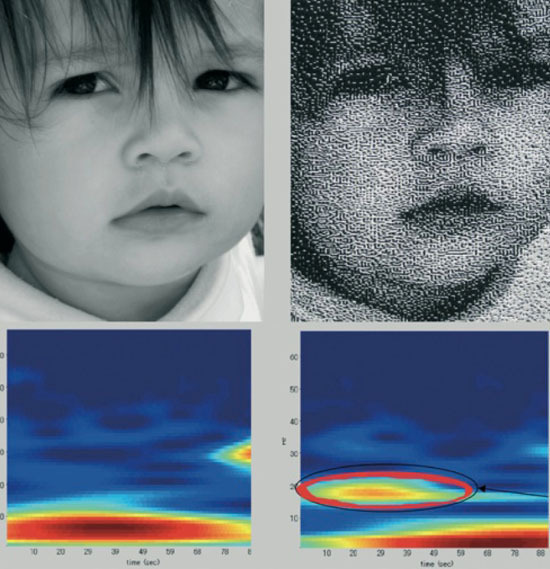 “An Investigation: Woven Faces and Neuroscience,” appeared in the December issue of ETN Textile Form http://www.exacteditions.com/exact/browse/573/911/7936/2/44?dps=on. From April 15 to October 22, 2011, a solo exhibition of Cook’s work, including some of the works created since the TREND residency, will open at the Society for Contemporary Craft in Pittsburgh as part of the Bridge 11 Exhibition Series. On May 5th, Cook and Dr. Greg Siegle of the University of Pittsburgh School of Medicine will present a lecture,”Woven Faces, Mapping the Emotional Brain,” at 6 pm. Hours are Monday through Saturday, 10—5 pm. For more information, visit www.contemporarycraft.org or call 412.261.7003 x 26. Thanks for sharing this research. Those of us who work in craft intuitively know the emotional connection viewers seem to have with the work. Its great to have quantifiable data that confirms that. And even better is the new work Lia is generating as a result of her participation in the project.